The study of Abu Dhabi's past is still in its preliminary stages. The discovery and excavation of sites such as Umm an Nar, Qattarah, Qarn bint Saud and the Hafit cairns over the last few years has given us an insight but, as Serge Cleuziou states, "Right now our knowledge is limited to a few facts and a series of questions." The specific reference is to the differences among sites in the Oman peninsula generally, but it applies equally to sites within Abu Dhabi emirate. No longer can it be stated without qualification that Umm an Nar was contemporary with Hili. As more and more evidence comes to light, one is faced with increasing problems of cultural interpretation. Sites that appear straightforward turn out to consist of more than one cultural phase, and often the material is mixed. How then can the evidence be explained? Studying artifacts in a site context is one of the techniques used. Where artifacts of different ages are mixed, as on the surface for example, it is difficult to interpret concisely. However, recognized sites within the Emirate do contain surface pottery samples typical of that site. The identification, dating and provenance of these artifacts are all necessary for an approach to understanding the site. The following comments refer to potshards on the surface, and hence of access to interested amateurs. Much more field work needs to be carried out and it is to be hoped that further sites will be found to complement those already explored, if only partially. It is important to remember not to collect every shard seen, just a representative sample. Notes on the surface context, vegetation, and a guess at the original shapes of the vessels as well as the exact location are necessary. 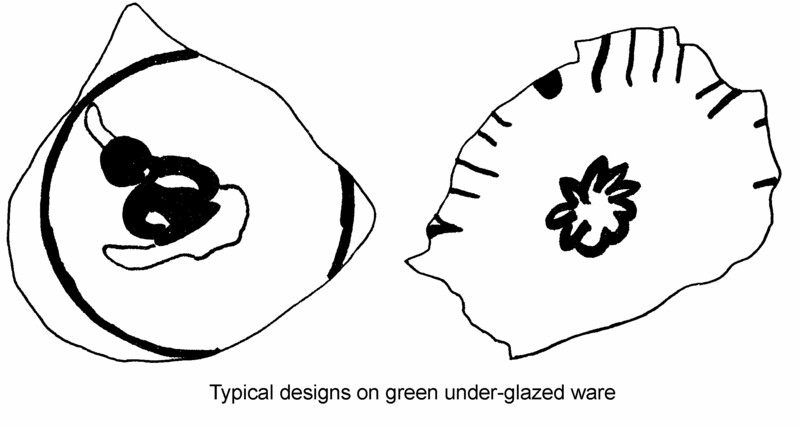 Pottery found outside the specific areas mentioned below should be roughly drawn and an indication of thickness and color given. While none of the pottery found may correspond to the following notes, it may be an important discovery. The desert is amply large and there is scope for new sites. Just outside the wall on the south side of Hili Garden, i.e. facing Buraimi, and Al Ain, there is a large area of scattered shards. It is an open gravelly region with sparse clumps of grass and the occasionally acacia tree, with drifts of red sand. 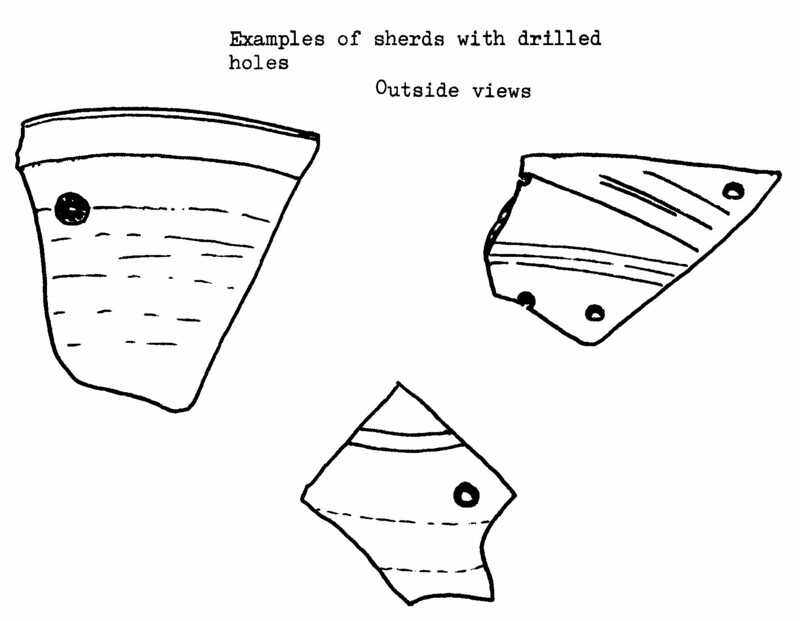 These shards are characteristic of third millennium ware found in archaeological sites in the immediate vicinity. The pieces are almost all pale red, buff or orange in color and sand tempered, i.e. the original clay was mixed with sand. The thickness of the shards varies from 0.3 cm to 1.75 cm. 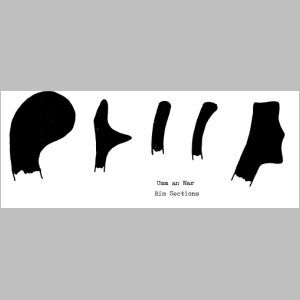 Shards of 1 cm to 1,25 cm in thickness predominate. Being subject to wind and sand erosion, these shards are often smoothed and rounded at the edges. Many of the thicker pieces are reddish or brownish on both inner and outer surfaces, but have a lighter, grayer streak running through the middle. The most plausible explanation for this sandwich appearance is that the pottery was given an intense, but brief firing in which inadequate time was allowed to burn out all the carbon derived from organic matter in the clay. As expected, this is not a feature of thinner shards. A few of the less thick pieces have small inverted rims. The only decoration on the surface examples at this site seems to be thinly incised lines, parallel to the rim and about 1 cm to 1.25 cm apart. 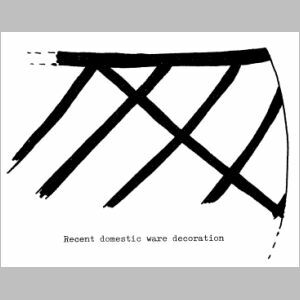 There is no evidence of the black wavy lines seen on excavated wares at this same site. It is highly likely that any attractive surface specimens were long ago picked up by passers-by. Those that are still lying scattered have been in situ for between four and five thousand years. At Umm an Nar, there are scattered shards of comparable date to those at Hili described above. There is more variety here, especially as the site is divided into two distinct parts. The higher part to the northwest is a cemetery complex where, if you are lucky, you may still find tiny fragments of fine red ware with geometric designs painted on in black. The best examples can be seen at this Al Ain Museum. Although only small pieces remain after the excavations of the 1960's and 1970's, it is clear that the original ware was of high quality, very thin and well finished. Down in the settlement area, some 50 meters away, the potshards comprise rougher, more varied domestic ware. There are some extremely thick rims (up to 3.8 cm across) and a whole range of small vessel fragments. Colors vary from red through brown, orange and yellow, to gray and near white. A few pieces appear to be burnt, presumably on open fires as cooking utensils. Some of this ware is tempered with fragments of older pots, broken and deliberately ground into tiny grains. Altogether it is coarser than the Hili ware and mostly in worse condition. This is surprising when it is remembered that all the shards at Umm an Nar have been exposed only since 1962 at the earliest, and have not been lying around for centuries. Presumably wind, sand and salt erosion have taken their toll. Nobody seems to have considered any possibly effects of pollution from the adjacent refinery. 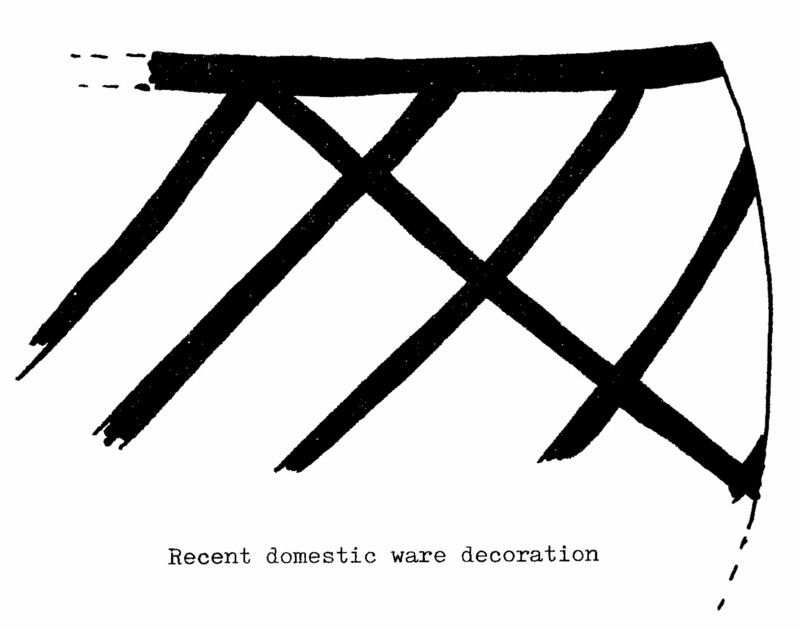 There is no decoration, incised or painted, on the domestic ware remaining. However, Umm an Nar is still incompletely excavated. 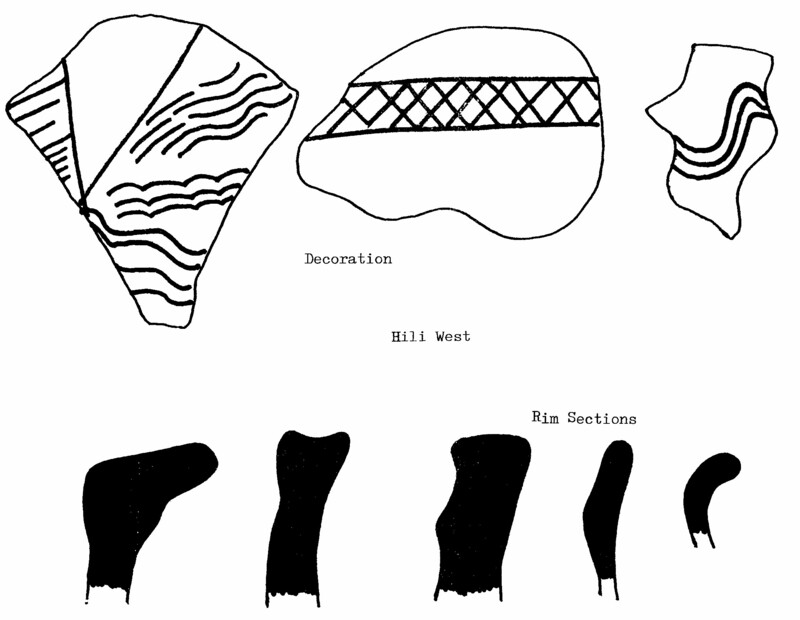 A freelance archaeologist (Walid al Tikriti) digging on the settlement site early in 1979 came across some fine black on red ware that he believes is unique outside the tomb area. The thick layers of ash in bands right across the settlement suggest that there might have been big fires on at least two occasions. This could have contributed to the poor stage of some of the shards, as well as the high frequency of scorch marks. 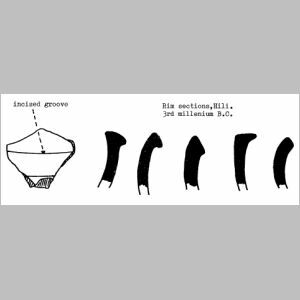 There is no evidence for any sequential advance in pottery design, and it appears from this evidence the site represents a single cultural period. About 500 meters west of Hili Garden, in an area of thickly drifted sand, are a number of first millennium buildings at present being excavated by the Department of Antiquity under the direction of Mr. Saeed Ur Rahman. These mud brick buildings are surrounded by surface potshards. A similar site is a raised site about half a kilometer long and less than 100 meters wide. Again, surface shards are numerous, dating to tow and a half thousand years before the present time. It is mostly thick ware, the clay often mixed with crushed pottery grains to give an overall buff color. This mixture, or body, often has a black or dark gray slip on the outside surface. The only decoration is by incision, typical patterns being criss-cross or parallel liens or wavy comb effects. Several shards have ridges and this indicates that they probably originated from jars, according to complete specimens from the excavations. Much rarer is a fine black on red ware, but it is very difficult to find any but the smallest fragments. This first millennium ware is typical of examples found throughout the Oman peninsula, including Ras al Khaimah, and Dibba on the Fujairah coast. 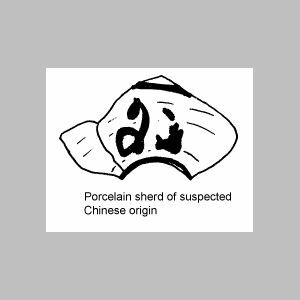 The exact dating of all the pottery described in 1, 2 and 3 above remains problematic. 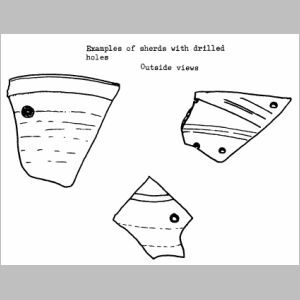 The surface finds certainly correlate with the excavated wares on the same sties, but the sites themselves are open to conflicting interpretations. The main consensus of opinion links these cultures with those of southern Iran of the third and first millennium BC. However, there are local variations and some overlapping of types. It is to be hoped that further sites will be discovered and studied. 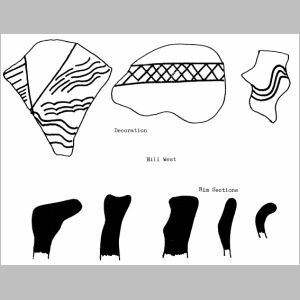 Whereas pre-Islamic pottery is restricted at present to a handful of well known sites and associated settlements, shards of much more recent origin are very widely scattered. There is little evidence for the first thousand years of the Islamic era in Abu Dhabi because of a paucity of written records and artifacts generally. 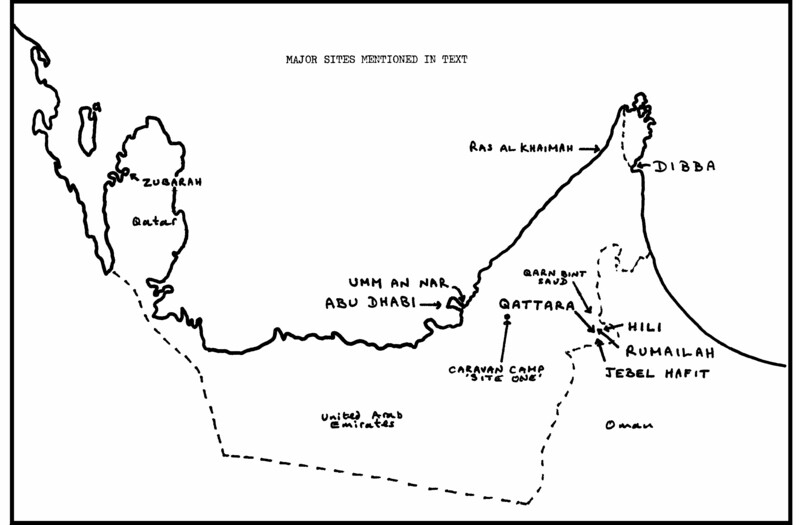 It is known that kilns existed in the hills above Ras al Khaimah from the 15th century until 1971, and also in the Buraimi area, but the Emirates has always suffered from a lack of high-quality clay and Islamic ware tends to have been imported. Wherever one travels in the desert, and however far from tracks, there is always the possibility of coming across shards. The commonest are very recent, very gritty in temper, and usually colored red, brown or gray. These are most likely 20th century domestic ware, mass-produced and carried around by Bedouin groups between campsites. The general fragility of this pottery, plus the awkwardness of transporting it, probably accounts for the abundance of shards found. 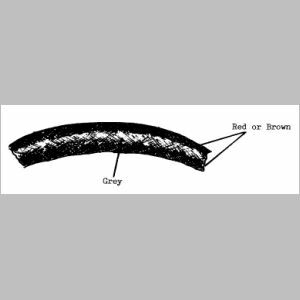 There is often a red, brown or black painted decoration - diagonal lines sloping down the outside from the rim, an inch or so apart, with the occasional crossed line. This ware is impossible to date even though complete examples may be found. The likely origin is Oman. The French archaeological teams working in the Hili area since 1976 have uncovered many vessels and shards of Islamic pottery. Preliminary studies indicate that all of this ware is post-16th Century. The Al Ain Museum contains fine examples of Islamic ware but some of the items are gifts from outside the UAE. For the past two years, the ENHG has been studying a site just off the Al Ain road, some 70 km east of Abu Dhabi. This seems to represent a campsite in the not-so-distant days when camel caravans were the usual means of cross-desert travel. The region is one of dunes, some moving in a gradual easterly direction up to four meters a year. There is a little vegetation including Tribulus terrestris, Dipterigium glaucens and grass species. Species of the salt-tolerant Goosefoot family are found at the lowest levels and on the gravel plain that in places divides the dunes. The highest dunes are about 15 m and consist of rows of steep eastward facing scarps and gently inclined shoulders. Most of the campsite debris lies at the foot of hollows beneath the scarps and hence some of it is being slowly covered by encroaching sand. The area covered by the site is roughly 1 km by 0.5 km, individual pockets of remains being scattered here and there. Sixteen of these little pockets have been found, with occasional single shards lying in between. Each pocket has its own variation but the whole area is generally homogeneous in artifact type. Common to the whole campsite is a profusion of fish bones (it is known that dried fish were often transported into the interior from Abu Dhabi), fragments of flint (possibly for making gunflints), heavy stone pounders, pieces of black glass bangles (common throughout the Gulf and East Africa from the 18th Century) and fragments of ostrich shell (the last ostrich recorded in Arabia was shot in 1941). Odd pieces of jewellery and a couple of coins (see Bulletin 8, p 23) have also been recovered. All the items are surface finds. 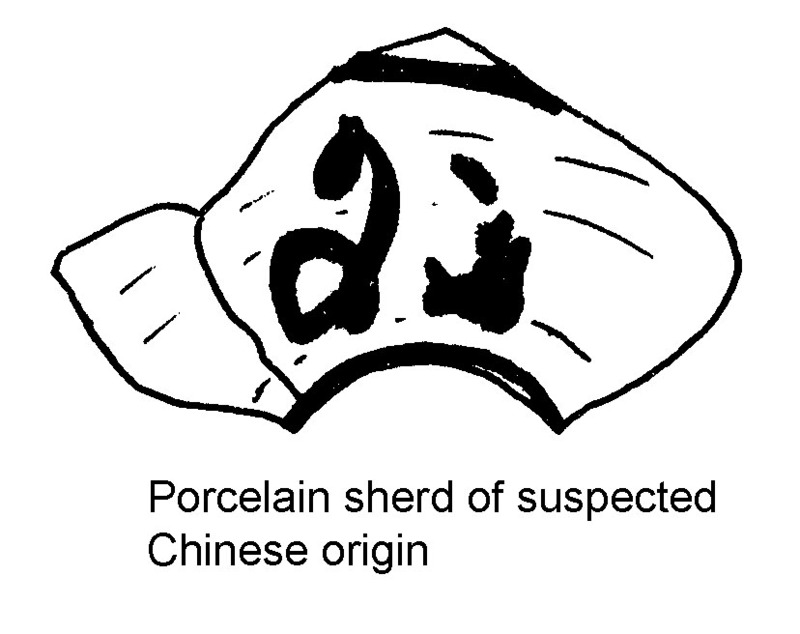 Pottery shards are to be found in great abundance. There are many recent types, even one or two complete pots, of type described above. The predominant colors are brick red and gray black. Rims are generally slightly inverted and some of the original vessels had four lugs set at equal points some 5 cm below the rim. Average thickness is 0.5 to 0.75 cm. Several pots are remarkably consistent in having an inside rim diameter of 14.5 - 15 cm. What makes the site especially interesting, however, is the existence of a number of shard types that are undoubtedly older. 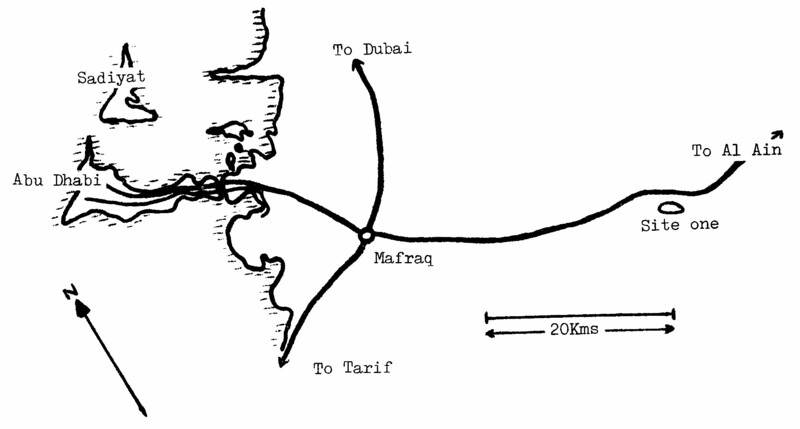 Much of it is typical of Gulf countries dating at the earliest from the 17th Century. 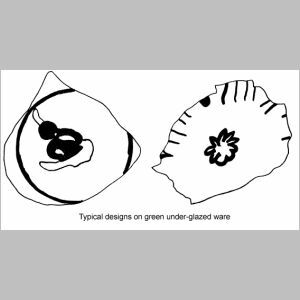 A common type is a green under glazed ware also found in Iran, the presumed source of origin. These pieces are covered in motifs that are in all likelihood Persian copies of Chinese originals. Flowery symbols and whorls commonly associated with Chinese style are typical themes. The actual body of the clay is poor, however, and often the glaze is in a far better state of preservation than the rest of the shard. There is also a brown-glazed earthenware with black mottling. Again, this is probably a copy of Far Eastern ware, since similar examples came from kilns in southern Iran where it has been named "Kung" ware. A few of these green and brown glazed shards have tiny holes drilled through them. Two possible explanations are riveting, i.e. to prevent a crack from spreading; and suspension, if the holes are near the rim. However, some of the holes do not appear to fall into either category, and such shards deserve further study. Just here and there among the scattered debris are a few shards of porcelain. Undoubtedly some are very recent, akin to the factory-produced, imported coffee cups in use throughout the Middle East today. One or two, however, are older and unlike anything to be seen or purchased locally. At least five pieces found are a "blue-and-white" ware which one school of thought believes was well established in Iran with the advent of the Safavid dynasty in the 15th Century (2). Certainly, imported Chinese stoneware has been excavated from beneath the Great Mosque at Siraf, across the Gulf, and dated to the first quarter of the 9th Century AD. Presumably trading with the Far East has continued on and off since that time. 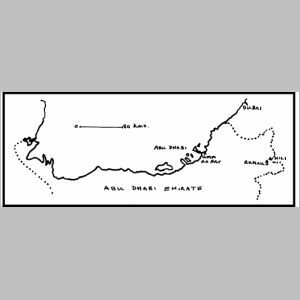 One particular shard parallels a design found at Zubarah on the west coast of Qatar, and a further example has been found stratified in late 18th Century, early 19th Century deposits at Fort Jesus, Mombasa. (3) No doubt Portuguese influence between East Africa, the Gulf, and the Far East stimulated trade in Chinese ware. 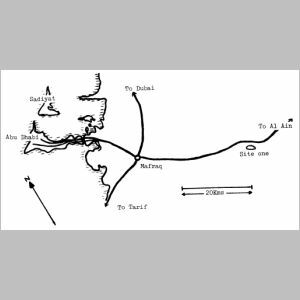 It should not be forgotten that Abu Dhabi town was founded in the 1960's and there is no evidence of local population prior to that date (excepting Umm an Nar). 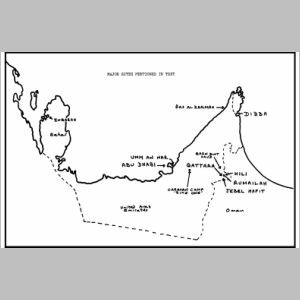 It would seem highly unlikely that any caravan route to the Buraimi region from Abu Dhabi existed before the late 18th Century. Probably, therefore, the artifacts found at Site One postdate the foundation of Abu Dhabi town, unless some of the vessels had been carried around by the Bedouin before that. Part of the site has already been fenced off unknowingly for forestry purposes and this highlights a problem. As Beatrice de Cardi states, there is an urgent need not to "overlook the fact that what amounts to a 'rescue' situation is now developing in the Gulf countries, albeit unrecognized as such since there are few archaeologists to proclaim the destruction of archaeological sties which is taking place as roads, factories, new towns and houses are built. "(4) This is especially so in the Emirates where many such sites are already beneath the foundation of towns. The desert is by no means immune from development, and there is every cause for concern that potential sites are not being recognized as such. May the ENHG appeal to all members to report the finding of any shard or possible artifact, however nondescript, so that investigation may be initiated before 20th Century development overtakes us. B. Bibby, "Looking for Dilmun," Mentor Paperback, 1974. C. Burney, "From Village to Empire, an Introduction to Near Eastern Archaeology", Phaidon, 1977. H. Hodges, "Artifacts, an Introduction to Early Materials and Technology", John Baker, 1964.